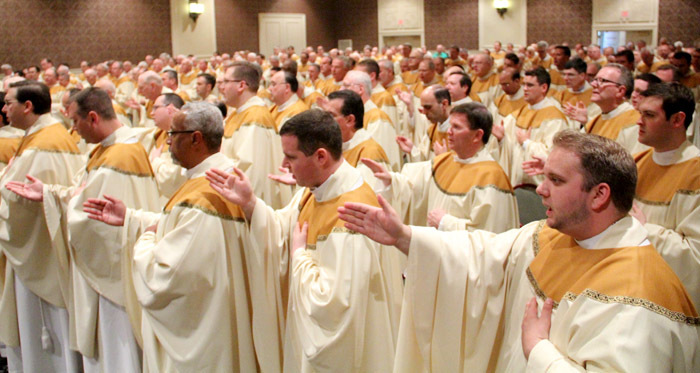 Hundreds of priests of the Archdiocese of Philadelphia took a break from their parishes and traveled to Hershey, Pa., for three days last week to be revitalized in their ministry. 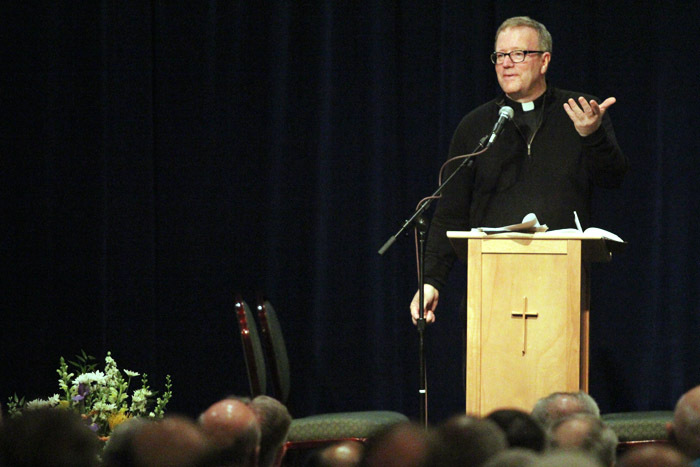 Their guide through the Convocation of Priests held May 21-23 was one of America’s most sought-after Catholic speakers and perhaps the most popular communicator of Catholic teaching and culture, Father Robert Barron. Archbishop Charles Chaput spoke to priests during the convocation, especially during a closed-door dialogue session, and prayed and dined with them throughout. Offering content rich in biblical sources and Catholic tradition, and employing a fast-paced speaking style without notes, Father Barron addressed the priests as “my brothers” in four keynote speeches and numerous other homilies during Masses and communal prayer liturgies during the three days. As priests model Christ in their ministry, they can trace the priesthood’s roots to the priests of the temple in ancient Jerusalem, Father Barron said in a keynote talk May 22. Another key priestly role was to offer sacrifice of slaughtered animals on the temple altar – characterizing what Father Barron called a temple that “smelled like a barbeque pit” – and sprinkle the blood of the animals on the Jewish people to expiate their sins. The role of the priest to consecrate the Eucharist – Christ’s real body and blood – at every Mass recreates the sacrifice of Jesus. “We have the privilege of feeding our people with the lifeblood of God,” Father Barron said. He pointed to the biblical story of Elijah the prophet, who engaged in a contest with pagan priests to call on the power of their god, Baal. They danced frantically around their altar all day without a response. Elijah mocked them, and they not only danced faster and more frenetically, they slashed themselves. Finally, Elijah called on God who showed his power in fire, and the prophet won the contest. “That great prophetic moment” of Elijah and the priests of Baal “is evocative of all the ways people give false praise,” Father Barron said. “Just dance around the altars and you will be happy” is the deceptive promise, he said, but the resulting unhappiness leads only to faster dancing and harming oneself. But doing so will have consequences for the priest, he said. Whether because of the fallout from the clergy sexual abuse scandal or the tide of secularization, “we all get marginalized” when trying to speak the truth by mocking false prophets. For at least one priest in the audience, the speaker’s message was spot-on. He said that overall he found the convocation to be “inspiring,” as it allowed him to see priests that he otherwise would not often see. 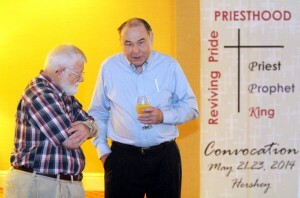 “I always find there’s a value in bringing priests together, to come together as a presbyterate,” he said. 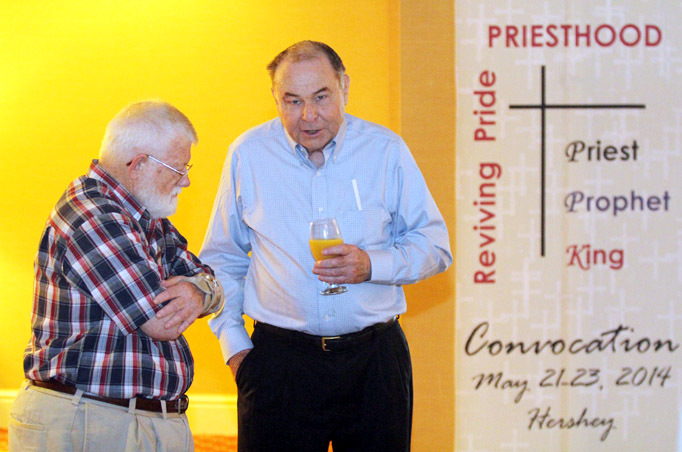 That sentiment was echoed by other priests including Father John R. McFadden (retired), who said the “most important thing is the camaraderie among the priests” attending the convocation. Another priest, Msgr. Ralph Chieffo, pastor of St. Mary Magdalen Parish in Media, agreed he enjoyed seeing so many priests of the archdiocese in one place. Msgr. 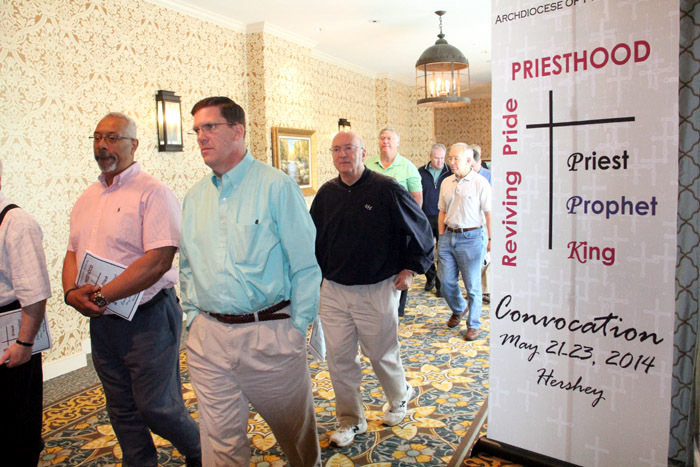 Frederico Britto (left) and Father Christopher Redcay walk with other priests to a talk by keynote speaker Father Robert Barron at the Convocation of Priests.